This unusually large pistol remains somewhat of a mystery. At first glance it is easy to describe it as an English long pattern sea service pistol. Closer inspection reveals that it is instead likely a continental copy of the English pistol. 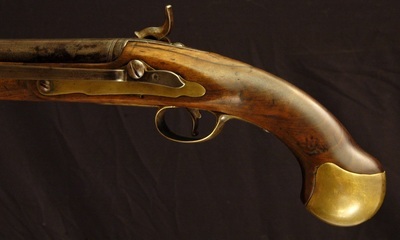 The converted flintlock with separate pan is of similar style to Dutch or Germanic pieces of the period. The brass hardware is again crudely reminiscent of the more finely crafted English pieces, and is nearly identical in size. The hole in the sideplate behind the rear lock bolt was originally for a long removed belt hook. By the end of the 18th century, most naval powers in Europe had standard military pistols for shipboard use. This copy was probably built for use on merchant vessels, which still sailed well-armed. 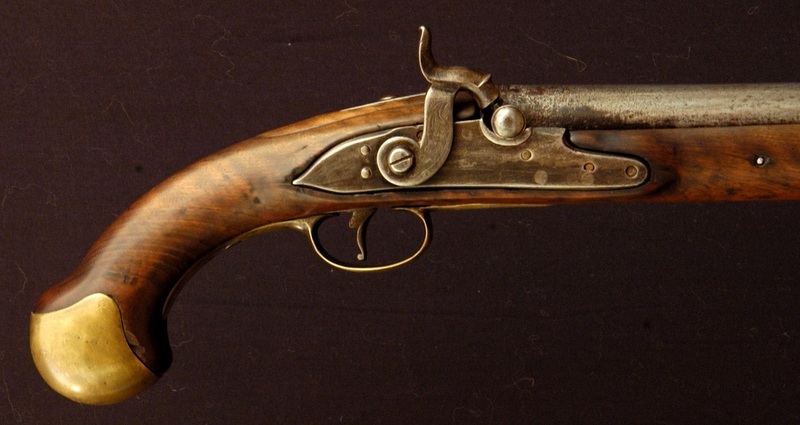 The pistol may have been made earlier, but scratched faintly into the stock under the sideplate are the dates "1817, 1818, 1819". This piece was horribly stripped and refinished at some point in the recent past. The entire pistol was wirebrushed with a wheel, removing all traces of dents and patina from the metal, and destroying any harder edges of the stock. Several pieces of wood were missing (or replaced with mahogany), and the stock refinished with sprayed on polyurethane. My work consisted of removing the new finish, replacing the missing sections of walnut, repairing cracks and holes, and applying true boiled linseed oil to the stock. The recent vise dents in the buttcap were swaged out, and the brass allowed to age. The wire-wheel texture on the iron was removed, and parts were left outside for a short time to rust naturally. The only new piece is the belt hook, engraved 2015, a close copy of an English sea service part.